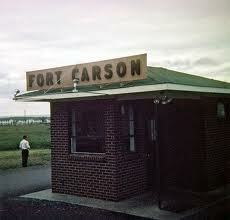 Fort Carson was established in 1942, following Japan’s attack on Pearl Harbor. The city of Colorado Springs, Colorado purchased land south of the city and donated it to the War Department. Construction began immediately and the first building, the camp headquarters, was completed January 31, 1942. Camp Carson was named in honor of the legendary Army scout, General Christopher “Kit” Carson, who explored much of the West in the 1800s. Fort Carson is a United States Army installation located near Colorado Springs, primarily in El Paso County, Colorado. It is 40 miles north of Pueblo, Colorado in Pueblo County. The 137,000-acre installation extends south into Pueblo and Fremont counties. The portion of the installation located within El Paso County forms a census-designated place (CDP), which had a population of 13,813 at the 2010 census. Fort Carson is the home of the 4th Infantry Division, the 10th Special Forces Group, the 71st Ordnance Group (EOD), the 4th Engineer Battalion, the 759th Military Police Battalion, the 10th Combat Support Hospital, the 43rd Sustainment Brigade, and the 13th Air Support Operations Squadron of the United States Air Force. The post also hosts units of the Army Reserve, Navy Reserve and the Colorado Army National Guard. 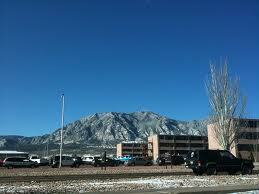 If there is one place you would want to be stationed it would be Fort Carson. It is a great base and the housing for officers and married NCOs is first rate. Colorado Springs is an amazing city and the gateway to Pikes Peak. I decided to drive my car to Fort Carson. I went up through Las Vegas, NV and stopped in Provo, Utah the first night. The next day I drove through Salt Lake City and then into Denver, Colorado where I spent the night at the Brown Palace Hotel. 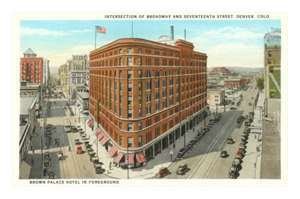 The hotel was built by the “Unsinkable Molly Brown” who survived the sinking of the Titanic on April 15, 1912. I was now almost broke and since I could always get a bed and food at an Army Post I decided to drive down to Colorado Springs and report a day early. I pulled up to the front gate and showed my orders and was directed to the Replacement Station. I signed in and handed my records and orders to the clerk at the desk and went to my assigned barracks. The next morning we attending a meeting and were told we would only be there for two days until we got our orders. At that time Fort Carson was the home of the 5th Infantry Division (Mechanized). My original orders were for assignment to the 2nd Bn 10th Infantry. Now, ask yourself this…Why would a Combat Soldier returning from Vietnam want to be assigned to an infantry unit? The next day I received a visitor from the 5th Admin Group. He wanted to offer me a job with the Personnel Section. The job would be to stay at the Reception Station and record information from the 201 Files of each soldier reporting in to a personnel assignment form. The reason they were talking to me was that the current personnel clerk was leaving the Army and they were looking for his replacement and that first preference was to an 11Bravo MOS returning from Vietnam that had decent test scores. The bad part of the job was that I reported to work at 11PM Sunday through Thursday and worked until I was completed. It took me about one second to accept the job. I was assigned to the 5th Admin Co Inprocessing with a MOS 71H20 Personnel Specialist. Not bad for an 11Bravo grunt. I was assigned my own room in the replacement barracks and did not have to pull any duty or clean the latrines or barracks. That was all done by our transient guests. Most nights I only worked 3-4 hours. The cook always had something for me to snack on and hot coffee. After work I went to the barracks and slept until I wanted to get up. I was able to do almost anything during the day and early evening until reporting for work at 11PM. Sunday nights were the worst since no assignment forms were completed on Friday or Saturday. There were two sets of bunk beds in my room and most times I was by myself unless someone came in for a TDY assignment. I do remember one time there was an inspection of the barracks and when the first sergeant came in my room and found me sleeping he pulled me out of my rack. The Lieutenant quickly explained to him that I was permanent party and worked nights. That seemed to satisfy the first sergeant and I was left alone after that. Being on the eastern slope of the Rockies and with an elevation above 6,000 feet it snows and becomes very cold. It started snowing in late October of that year. On Thanksgiving Day a couple of us went skiing west of Denver. I had only been skiing a few times before and did just terrible. Driving back to Colorado Springs I decided to take ski lessons at the Broadmoor Ski Resort which was only a few miles from Fort Carson. The resort had a lighted ski slope and you could take lessons either day or night. I took the early evening group lessons. After a while I skied almost every night at the Broadmoor and on the weekends went to many of the other ski areas in Colorado. One of the buddies I met was transferred to Fitzsimmons Army Hospital in Denver which is only about 60 miles north of Colorado Springs. He had us come visit him and we would stay in an unoccupied ward for the night. We did this several times until one time we were rousted by some MP or security guard and that ended our free stays. 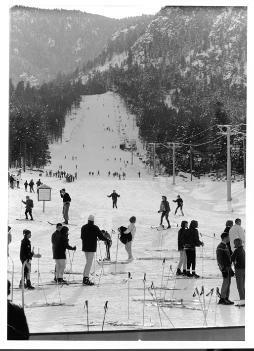 So between skiing and not pulling any duty my last five and one-half months in the Army – life was good. I was officially released by the Army on January 31, 1969. 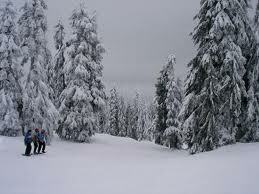 I stayed in Colorado for several weeks and skied in both Aspen and Vail. Then I returned to Colorado Springs to say goodbyes to some friends and the next morning drove more than 1,150 miles, in about 19 hours, straight through to home in California headed for civilian life. Fort Carson 1966. Charlie Company 1st Battalion 10th Infantry(Mechanized) 5th Army. First day of duty at Fort Carson, low was 8 degrees. California boy. Burrr! Yes, I recall the winters well. Flew in to Ent AFB from Fort Bliss, Texas (my first duty station after induction). in February 1966. I looked out the window of the plane and there was snow everywhere. None of us knew where we were headed. Bused in to Fort Carson with the smell of oil burner heating. Will never forget that smell. Pulled out of bed the next morning at 5:30 am to see 2 foot icicles hanging off the roof and 23 degrees outside. For a California boy, this was not good. Company C, 1st btn,10th inf Mech of the 5th Army. My cousin is suffering from some of the same ailments. He was at Fort Carson until the end of 1972. Can you tell us what contaminated equipment was brought back from Vietnam, and what kind of training was done on spraying? sprayed to kill grass etc…..at va need infor. for med…what other chemicals ? Hubby and I were at Ft. Carson early Jan. 1966 through Nov. 1967. The foliage was sprayed with something and he was often required to police the areas without masks and bare handed. He has suffered severe muscle pain beginning shortly after our return. Now, soft tissue sarcoma. Many of his buddies suffer cancer like diseases including lupus, We are applying for disability related to exposure to chemicals and artillery causing hearing loss and tinnitus. I heard an MP won his case regarding agent orange exposure at that location. Do you have any helpful information? Thanks for your help. My husband was stationed at Ft.Carson from early 1966 to late 1967. He is now being tested for soft cell sarcoma…one of the presumptive conditions. We suspect that he was exposed when he was required to police areas after they were sprayed. Of course, he may have touched contaminated equipment. Do you have more info on the a/o spray tests? I was at Ft Carson from 1969 to 1970 . Have had heart problems and Hodgkins Lymphmoma and other problems.Have a case pending appeal. Any information u have on Agent Orange and pesticides used at Ft Carson would be appreciated. Well, I am borderline diabetic, and have COPD. None of which came from any contact with Agent Orange. I was not in Vietnam and was out of FC before any planes or equipment came back to the states that may have been used in the AO campaign. My problems, including my plugged arteries, stem mostly from a lifetime of improper eating, and having inherited a low immune system. Millions upon millions of people have cataracts. Sorry to hear about your issues but I doubt AO had anything to do with them. Cut the bread, sugar, and carbs in general, eat the paleo diet and enjoy. 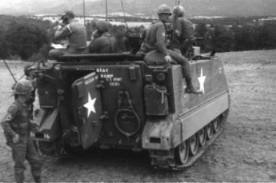 I was at Carson C 3/77 Armor 1968-1969. I just saw your post 14 months later. I was at Carson in 3rd platoon C 3/77 from 6/68 to 1/69 when I was shipped to Nam. Oddly enough, I landed in 3rd platoon C 1/77 over there. My biological father was stationed at Carson in the latter part of 1970 and was dating a young mexican girl named Mary. He left her when she got pregnant with me and I have never met him to this day. His first name is John. That is all my Mom would tell me about him. I know it isnt much but you never know. I am hoping maybe you might remember someone like this. Thanks. Does anyone have documentation to support claim that Ft. Carson was used as a training ground for herbicidal sprays including agent orange? I was stationed at Fort Carson from December 1965 to July 1967 and I am trying to remember who the Post Commanding General was for that period of time, if anyone remembers please let me know. The only thing I remember is that on bivouac that we were exposed to tear gas at least that is what I thought it was. We had to carry our gas masks and use them. Major General Autrey J. Maroun from 1964 to 1966. I am searching for my father. Here is what I know: was stationed Colorado in 1969, was Sgt or Staff Sgt, Navajo or Indiana heritage. Name I was told is Jim McLean. He had a sister named Gene, Jean (not sure on spelling). Mother and father never married. I have a photo if anyone can help. Also where could I look at photographs of enlisted during this time frame? At Ft. Carson during the last 4 months of my active duty commitment. Took Recondo Training there. Any Challenge Coins from that group? At Fort Carson from October ’66 to October ’68. Basic, AIT and the 5th Admin Company Machine Branch (Data Processing Unit). Sgt. E5. ETS 10/17/68. Anyone have any pictures of helicopter training 66-72? Front Gate pics or classrooms or training? Doing a reunion video and need help. Good resolution!